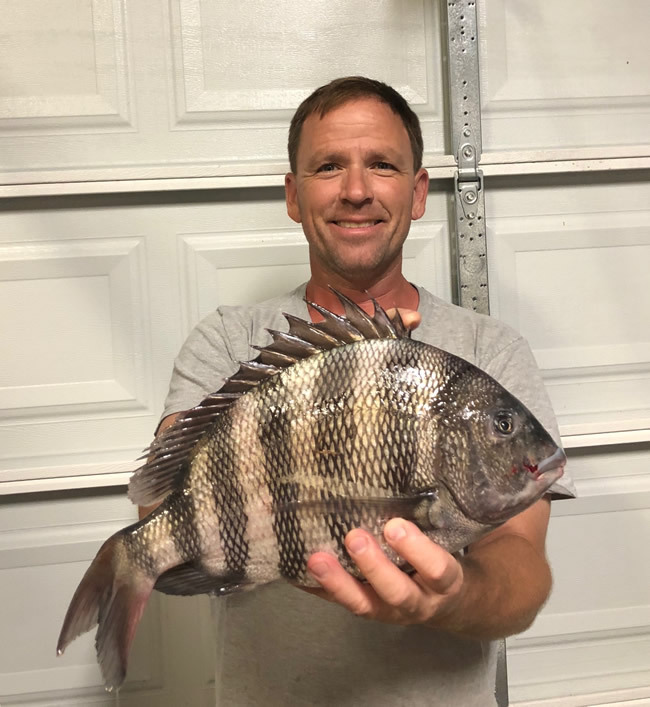 Kevin and I decided to start in the Chesapeake Bay Area this morning where we picked up three sheepshead , then we decided to see what other species may be interested in the fiddlers. And that is when the real fun started . It was early afternoon, we drove towards Cape Henry area . We both drop our lines . Kevin says he feels a nibble. I am fishing the opposite side of the boat and I am feeling a nibble too. I then pull my line up and no bait and no fish . Hmmmm ok , I re bait and dropped it again. What happened next I probably will not forget for a very long time. I put the rod in my left hand and I reach for something with my right hand and my line goes off! I squeezed the rod with my left hand as hard as I can so I don’t drop it in the water and then I grabbed it with my right hand because this fish just starts giving intense pullage . Kevin looks over to see what going on and I said it’s fighting like crazy! My left wrist was sprained during the fight At this point , this fish has my full attention! It’s zipping & pulling and I almost wondered if I had a sheepshead. It definitely had some similarities and it was acting that crazy! Kevin and I see this fish starting to surface but it’s a very nice black drum. I was using a carolina rig with a fiddler. My wrist started really hurting as I’m holding the black drum for the photo and I half jokingly say “ you are a bad fishy ! “ I swear that fish understood now looking at the expression on the fish’s face in the photo. We kept one and released one more black drum and are out of fiddlers now. I start using cut bait. I catch a 36 inch red drum then release it. I wanted something bigger. I laugh and look at Kevin and I say , it’s time for Bessie. He said Bessie? I said yes , Bessie.